← Jesus Is Coming Soon! The word plagiarism has a curious history. It is derived from the Latin plagiarius—literally, a kidnapper who ensnares children or slaves in a plaga (net). The Roman poet Martial (40-102 AD), fiercely protective of his literary creations, was the first to apply the word plagiarius to someone who stole his words with false claims of authorship. This entered the English language as “plagiary,” and then, in the seventeenth century, plagiarism, as the theft of words became a more and more widespread problem amidst the burgeoning culture of books and literacy made possible by the printing press. Something can be “stolen,” of course, only if it can be owned in the first place—and so naturally the modern concept of plagiarism grew up alongside the development of copyright law and the status attached to authorship and originality. I found Baily’s article interesting if not rather disturbing. There seems to be a wide variety of reactions to it. Some pastors found guilty of plagiarism have been fired while others have, for whatever reason, been elevated to positions of greater scope and responsibility. Clearly it’s not the be-all-end-all sin, but what jettisoned Joe Biden from 1988 presidential contention appears to be on the rise within the Christian community and, in my view, this is not a healthy trend. So determining how to wade through one’s moral obligations in this changing digital world (both as a hearer/reader and a speaker/author) is clearly a complex task. Most of us have probably been guilty of some level of plagiarism either intentionally or not, but perhaps simply because its a practice common should not give us license to disregard abuse, especially if it’s blatant and premeditated. Most of us have few original thoughts (I guess I should speak for myself). We glean the majority from others and are most often not even cognizant from whence an idea came. The question is, should there be a different level of accountability during daily conversations and those who dispense knowledge from pulpits, lecture halls and print/digital media? In the normal discourse of everyday life we effectively become conduits of the burgeoning information overflow. So my question is, should the standard be the same as for pastors, teachers and speakers who may only appear to be delivering fresh content? In other words, should there be a different level of scrutiny for our general conversations where we might hear something interesting and pass it along having no clue of its origin, and the speaker/author who intentionally takes the words of others (perhaps written in an online blog or used in a sermon) and pretends that they are his or her own? And is this latter offense worthy of concern? In this cyber age, protecting intellectual property is going to become a greater and greater concern. In daily interactions it would be nearly impossible and downright cumbersome to cite our sources and stopping every few sentences to use finger quotation gestures, would be very awkward. Not only that but quite frankly, recalling, on-the-fly, specific sources in our melting pot minds, would be nearly impossible. That said, if I’m reading a book that provides the brunt of my ideas and during daily discourse I pass them off in a way that makes it appear that they are original thoughts, would that be somewhat dishonest? Clearly I wouldn’t have broken any copyright laws but wouldn’t it be more honorable to at least mention the book, article or lecture where an idea was culled. Now, in the matter of public speaking and authorship, there are already laws in place to protect private property. So, would it not be wise in the Christian community to at least match that standard of expected conduct? Some of the articles I’ve read on this subject or those I’ve interacted with, have suggested that plagiarism isn’t wrong unless and until the plagiarizer benefits monetarily. 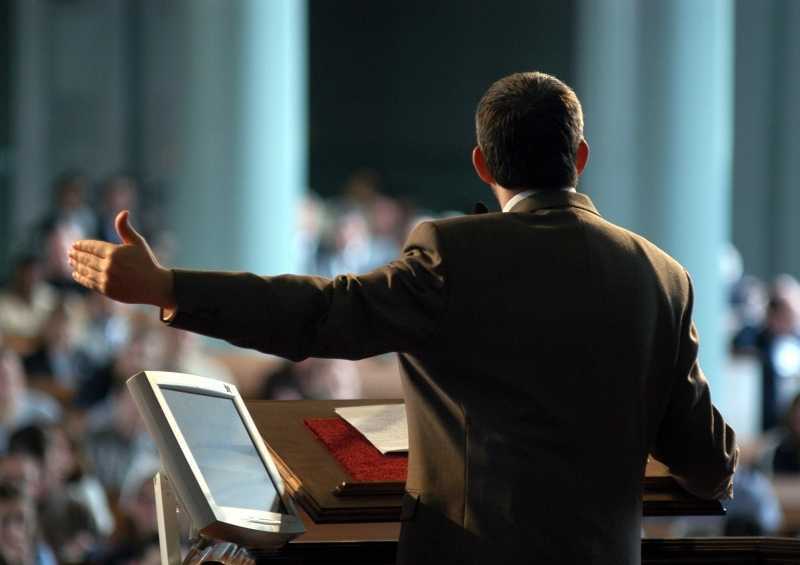 Let’s say a pastor or motivational speaker has enjoyed increased stature by using other people’s words, and therefore has benefited from the substantive growth in his/her online presence or overall popularity and notoriety … and if this amplified regard and visibility is ultimately parlayed into greater income, doesn’t this indirectly meet the criteria for monetary gain? And if that is the case, even if there is no direct tangible profitability i.e. through selling a book with plagiarized content, that would not absolve the guilty party would it? 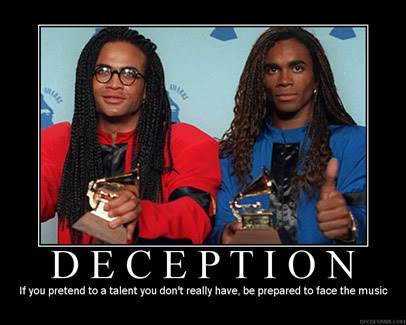 We’re all keenly aware of the group Milli Vanilli and their brush with success. If you recall they tumbled from their pedestal when their lip-syncing was uncovered. In reality, all they did was pretend to sing songs. And people really enjoyed their act. So why was there such outrage? They didn’t actually steal the voices of others. The vocalists signed contracts to provide the voices for what became Milli Vanilli, so there was no ambiguity in this arrangement. The producer hired both the lip-syncers and vocalists and forbid anyone from divulging their secret. But as we well know, “conspiracies” don’t remain such for long. At any rate, have you ever wondered why there was such brouhaha over a situation where no one was essentially stealing anything or violating copyright laws? So again, why were these men publicly shamed and humiliated? They didn’t hurt anyone and the ones whose voices they lip synced had agreed to the entire arrangement. Perhaps it was because people felt deceived. The world had become infatuated with Fab Morvan and Rob Pilatus, but it was all based upon smoke and mirrors. They were not who they and their producer represented them to be, and apparently that deception was not appreciated. Could these men have ever become stars without using the voices of others? Clearly not. Could the vocalists have become stars in their own right without the look and persona of these actors? Probably not. Well, then, shouldn’t the same question be asked of pastors and teachers who do the same? In Finding Forester, Jamaal Wallace, a brilliant kid from the ghetto, attended a very prestigious private school. After entering a marvelous piece of pros into a school writing contest he encountered severe scrutiny. As it turned out, Jamaal had merely begun with a few words from something his famous mentor had written. Though the overwhelming majority of his paper was of his own creative imagination, the fact that he plagiarized the first few lines was of such grave concern that it almost caused his expulsion. In the pivotal scene of confrontation between Jamaal and his very critical teacher (a writer wannabe very jealous of Jamaal’s mentor’s success), Jamaal was justly accused of plagiarism. As it turned out, the few words that he ‘borrowed’ to begin his paper had been part of an article that appeared in the New Yorker! But the point is that even the use of those few words created a firestorm. As we learned earlier in the movie, a mitigating circumstance was that his famous mentor/author/ friend was the one who actually encouraged him (Jamaal) to be begin the flow and cadence of writing by starting with his mentor’s words. The caveat was that no writing that took place in the apartment of his friend and writing coach, Mr. Forester (Sean Connery), was to leave the premise. That violation nearly cost Jamaal his scholarship. That wonderfully heartwarming scene is captured below. But the point is that lifting words and pretending them to be one’s own was determined to be a very serious offense. In Good Will Hunting, an arrogant condescending Harvard student was trying to impress a female student in a bar by embarrassing a kid (Ben Affleck) from the hood who was trying to pretend to be well educated. This Harvard man was resoundingly outed when Affleck’s well-read janitor friend from Southey (Matt Damon) began finishing this Harvard kid’s quotes while citing the commensurate authors. This was the ultimate putdown because the Harvard guy was trying to make it look like he was being original, when in fact this impressive spewing of platitudes was nothing more than a regurgitating of other famous people’s thoughts. He was trying to create the illusion that he was basically somebody that he was not. Along the same line as using the ideas of others, it appears to be a growing trend for pastors to purchase sermons from sermon outlets. Is there anything inherently dishonest about this practice? Scot McKnight in “Plagiarizing Sermons” identifies a number of underlying problems with this practice. There are a number of factors not the least of which is borrowing personal illustrations and sharing them in the first person as if they were the experiences of the pastor. Now, it appears that no copyright laws are being broken since these sermons are sold with the creator’s full blessing. But again, we’re confronted with this idea of deception. Does the pastor leave the impression (intentionally or not) that his sermons are personally crafted? The parishioner mistakenly concludes that the pastor has spent hours of study in order to develop the convictions and salient points laid out in the sermon. And it logically follows that there would be greater esteem for puppeteers developing fresh content than the pastor who bought his or her message. I am not insinuating that this is an illegitimate or unethical practice but I am attempting to make the point that if the congregation is unware that a sermon is canned, it may be somewhat deceptive. What would be wrong with saying something like, “I enjoyed the sermon series so much that I decided to use it as my guide”? At this point I think it’s prudent to ask whether we should simply ignore this pulpit? Is the theft of intellectual property only a sin if we derived a direct monetarily benefit? Or is it a problem that should be addressed because those who “borrow” the words of others are engaged in a form of deception? Some may ask, what does it hurt? The author of the original material will probably never know. And the fact is that they might actually find it flattering that their words were being copied. Charles Colton once wrote, “Imitation is the sincerest [form] of flattery”. In Christianity Today’s website, an article entitled, “When Pastor’s Plagiarize” gave somewhat of an apologetic, justifying, at least to an extent, a pastor’s license to share borrowed content with others. Though I agree with a number of the points made in the above article, I think the author omitted some vital factors. The sermons passed down by English Reformers were assumed not to be “individual efforts but the work of the church”. Is that actually the case in many of the situations dealing with plagiarism today? No one expects all the words from a pastor to be original. Coming up with 50 sermons per year, year after year, straight from one’s own study, is clearly a monumental task. So I get that. I am awed by any pastor’s ability to constantly create fresh Biblically-sanctioned sermon material. However, what’s wrong with holding up a book or two or citing the articles that inspired the sermon? What’s wrong with quoting the source and giving proper attribution when taking sentences verbatim from others? Yes, it’s wonderful to see the Christian community operating on an organic level, always building on the efforts of others. This kind of collective synergy is necessary to the growth and vitality of the Gospel message. No one is asserting that pooling resources is unhealthy or imprudent. However, again, what’s the problem with proper attribution? Could it be that some pastors are consistently and serially tapping into the content of others to the point where it would be embarrassing for them to admit that much of their most astute sounding verbiage has been copied verbatim? I called a pastor friend I’ve known for many years and asked him what he thought about this whole matter. As it turned out, he was involved in teaching a course motivated by book someone else had written. Though he said that most of the points he addressed in the class were of his own creative juices, since he was empowered and encouraged by the book’s overall message, it was second nature for him to give full credit to the author in each class. It should be noted that this pastor was under no obligation to disclose the wind beneath the wings of his teaching points, since none of the material he presented was plagiarized. However, he felt that it was necessary to cite this other man’s work. So, in closing, let me ask you these few questions. Do you think plagiarism is a problem within the Christian community and if so, what would you recommend doing about it? Should a pastor guilty of constant plagiarism be censured in any way? Would you support action taken against them or do you think this is an insignificant offense that doesn’t warrant any negative action taken? Let me be clear that I am not without foibles. I am not casting the first stone. Sometimes it’s laziness, other times ignorance and occasionally it’s willful and blatant deception. And it seems that the punishment should fit the crime. However, if we continue to ignore this issue, won’t we be in danger of compromising the integrity of authors and pastors and won’t we be guilty of demeaning creative abilities?